I got an email from Cherrie of Sweet Cherrie Pie a few weeks ago asking me what should be this month's theme for Kulinarya. We are both co-hosting this month's event and she told me that she wanted something "celebratory" since it's her and her son's birthday. What a sweet coincidence, I thought, because there's nothing more special than giving birth to a son on your birthday. Oh and an even greater coincidence, August is my birth month too. So to answer Cherrie's question, my ideal celebratory birthday meal would include pancit (noodles) for long life but since we just had pancit as a Kulinarya theme two months ago, I suggested lumpia (spring rolls). Lumpia is a birthday party staple. It may come in many variations. Being one of the hosts of this month's theme, I wanted to stay close and as authentic as possible to the fresh spring rolls that we usually order for parties back home. Thus, I chose to feature Lumpiang Ubod or fresh heart of palm spring rolls. Lumpiang Ubod is just another kind of Lumpiang Sariwa (Fresh Spring Rolls). It's called "fresh" to differentiate it with fried spring rolls or Lumpiang Shanghai that we Filipinos are known for making. But here's the challenge: where would I get the Heart of Palm? I'm glad that my reliable friends at Google taught me that I could use either asparagus, artichoke, yellow turnips or rutabaga as substitutes for heart of palm. And when I saw rutabaga at the grocery shelf, I knew that I found a good substitute. It was a good choice for the rutabaga was the closest substitute I could find. 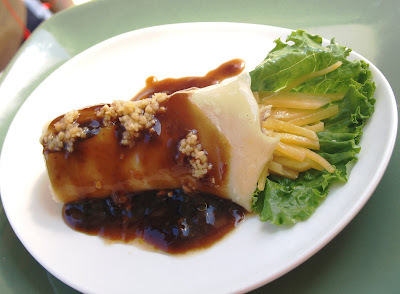 For those of you who are craving for the real Lumpiang Ubod but do not have heart of palm available I give you the recipe of Fresh Rutabaga Rolls or Lumpia ala Lumpiang Ubod to enjoy. In a cooking pan, saute the onions and garlic. Add in the shredded chicken breast. Drain the rutabaga and add it to the pan. Stir and cook for about 8 minutes. Season with salt and pepper. Set aside and let it cool. Mix all the ingredients together. Whisk it gently altogether until there are no more lumps. In a thick pan, pour a thin layer (about 1/4 c) of the batter. If you have a crepe maker, it comes in handy but a non-stick pan will do. You just have to spread the batter thinly into the pan. Let it stand for a minute and flip it over. The wrappers cook fast. Don't get frustrated if your wrapper is not perfectly round or if it breaks, it happens. Make sure not to use your fingers too, you'll burn them. Repeat the procedure until the batter is consumed. Mix all the ingredients together : soy sauce, water and sugar into a saucepan. When boiling, add the cornstarch mixture, stirring continuously to avoid lumps. Remove from heat when the sauce begins to thicken. On a flat surface, put the wrapper on first. Then layer it with lettuce. Scoop a handful of the rutabaga filling . Roll them up together. You must be gentle as the wrapper is too delicate. Check out Kulinarya page to know who else is in the Club! Malou - happy happy birthday! I remember you guys mentioned that there was a reason you chose lumpia. Thanks for the tip on substituting ubod. 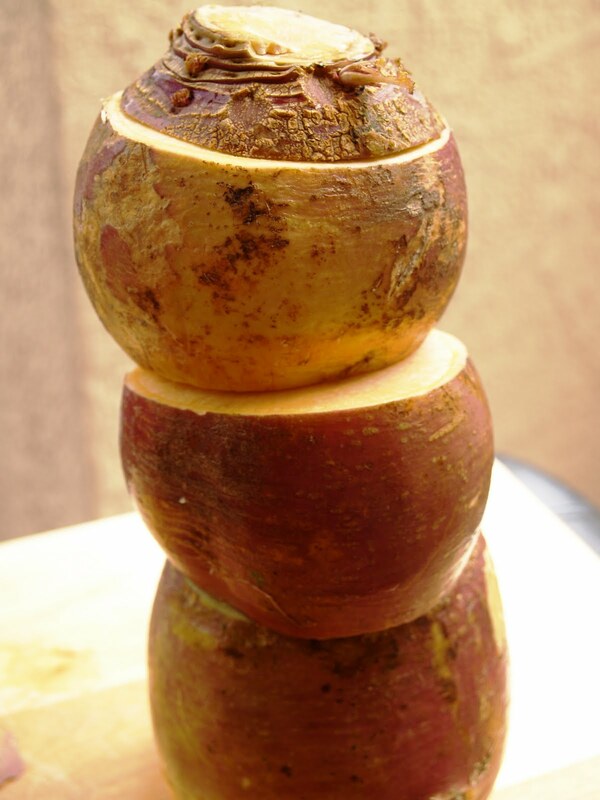 I desperately wanted to make ubod BUT was not able to find heart of palm... great to know I can now use rutabaga! Happy birthday my dear Malou. I am yet to make my kulinarya lumpia dish. Rutabaga I don't think I have ever cooked with it. 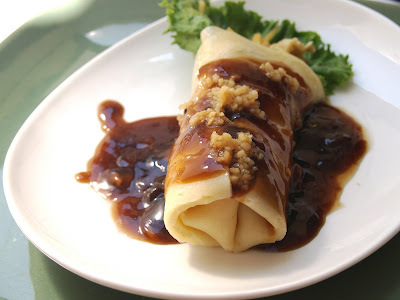 This is a fantastic version of lumpia. Hope you have a wonderful birthday celebration. The rutubaga spring rolls looks so delicate and tasty. Great job. Happy Birthday to Cherrie, her son and you on our Birthday...wow! Hope all of you had a great time. This lumpia is perfect for celebration. Love your homemade lumpia skin. It looks different and delicious. Would love to try. Thanks very much for sharing. Trissa: thank you for the birthday greeting... i hope you get to try it... it taste like the ubod we're used to. Kath: same here it was my first time and it was a delightful discovery. oh thanks for the greeting too! Lazaro: thanks for the greeting and the kind words! Mary: you are the sweetest Mary. Thanks for the follow too! Happy Birthday Malou! These spring rolls look delicious. I had no idea that I could make my own spring roll wrappers. Will have to try this. happy birthday! The spring rolls with rutabagas sound very unique and delicious! Happy happy birthday, Malou!!! Rutubagas are a great substitute for heart of palms... thank you for the recipe. Enjoy your birthday!! Penny: thanks for the greetings and the kind words.. the wrappers look like crepes only thinner. Rebecca: the filling is a great discovery. Cruncy and juicy at the same time. Goes well with the sauce. 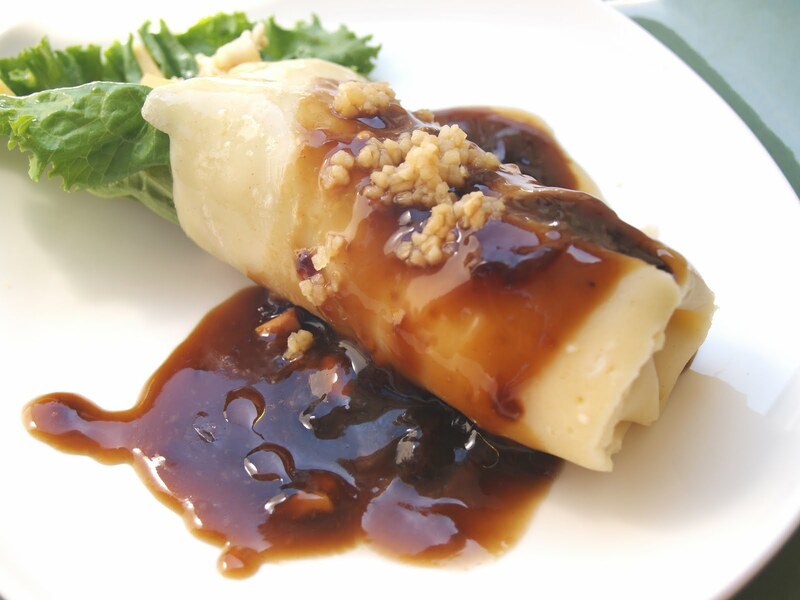 Natashya: thanks for the greeting... the spring roll is very refreshing... glad that i have discovered a good sub for the heart of palm that I used to love. Jun: Oh you're so sweet. Thank you for the birthday greeting. How is Seatle right now. Im so excited for you being there. Thank you for the greeting Tracey. Papayas are always available here in SD but it's interesting to know that kohlrabi could be a substitute... Thanks for sharing! That is so cool and original for a spring roll filling. I'd love to try this. Belated birthday greetings Malou! I would have never thought of this substitution...good job making our lumpiang sariwa accessible to those in different hemispheres! 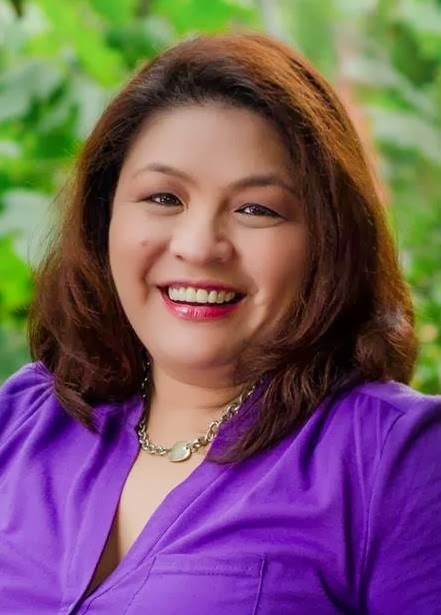 Belated Happy Birthday, Malou! Now I have a reason to grow RUTABAGA! I cannot wait to try! I've only had lumpiang ubod once when my mom had to hire someone to cut down a palm tree in our property for fear of it falling into our house. The fresh hearts of palms were given away to neighbors and it seemed like the whole neighborhood were eating lumpiang ubod for days! Anyways, enough of my long-winded story :) So glad to know I can use rutabagas as a substitute. Happy Birthmonth to you, thanks to you and Cherrie for a great theme! Oh these look so scrumptious! Happy birthday chica. What a way to celebrate with these delicious rolls. HH: i hope you will be able to try it, and please let me know it goes. Annapet: you have to teach me how to garden... moonglowgardens haha.. great to see you stop by and thanks for the birthday greeting.. and yeah it's not late but advanced pa nga e.
Carol: I didn't even know that "ubod" is called heart of palm hahah so you don't have the tree anymore? rutabaga is available locally naman.... so it's ok thanks for the birthday greeting. Happy Birthday Malou! Hope you enjoy your special day surrounded by your loved ones. happy birthday malou, and thanks for a delicious theme. rutabaga? who knew? creative substitute for ubod! Hello, you're the winner of the giveaway, pls come to my site and leave your mailing address. happy bday! love your blog! Happy belated Birthday! Haven't heard of rutabaga, so thanks for introducing me to that. Is it a rootcrop, a fruit? Cherrie: Happy Birthday to you too. I am looking forward to reading your lumpia post too. Annie: thanks for the greeting. It was a delightful discovery.. and it does taste like Ubod. Anncoo: Wow sweet! Im so excited and looking forward to receive it soon. Thank you so much! Chef_D: thanks for the greeting and it was my pleasure to be one of the hosts this month. Cusinera: thanks for the greeting. yeah try it, it really takes the ubod to life with this substitute. mr. pineapple man: thanks for the greeting and the follow. Looking forward to know you through our blogs! Jen: to be honest i don't know either but let me find out from my friends at google hhihi. Joanne: thanks for the greeting! girlichef: Glad to find someone who loves Rutabaga! Thank you! Thisis intriguing. I have never had anything like it. You do introduce me to wonderful foods.